One thing I think we can all agree on: the trials must be made in the courts. However, there is a unique exception in the world and, I assume no one will deny it, is called Silvio Berlusconi. Oh yes, because in his case the trials should be made in the courts, if he went there when he must. For what? To prove his innocence, to name one at random. Otherwise, someone might remains in doubt or with suspicion. But if some newspapers have published the document with the evidences that led the magistrate Cristina di Censo to proceed on the immediate trial on Italy premier, well, it’s normal that people have some questions about it. That is not because they're communist executioner and hypocritical moralist, but simply because a citizen of a democratic republic has the right and duty to know whether the man who governs his country had abused a minor or not; because this is the theme, not the privacy violation and this is sacrosanct if you are a hypocritical moralist communist executioner person or an adoring Silvio’s fan. Here, imagine having one of them in front of you, for example Lamberto. He is a strong supporter of Italy Prime Minister and above all he trusts him. In other words, he is among those who do not believe the allegations concerning him and considers them some ashamed deception by the leftist judiciary. He does a little research and says: "Ah, she’s Ruby…"
In any case, the obsessed fan rejects the outrageous slanders against his myth. However, Lamberto has a seventeen years old daughter and he can not remain indifferent to the fact. So, for mere curiosity, he searches on the net what happened in Italy in the days when, according to the Bolshevik red judges, Silvio should have abused Ruby. Finished the list, Lamberto shuts off the PC monitor and looks out the window restless. 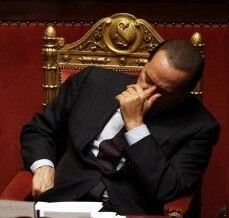 So he closes his eyes and thinks: "What if the allegations to our Silvio were true?" So with a little courage, and much, much stomach, he imagines Berlusconi with Ruby in the act which is under investigation of, exactly at the end of those days, sometimes marked by tragic events and generally of considerable importance for his country. His faith is about to give up, when he slaps himself to wake up and with a cheeky forcibly tone, in a desperate attempt to self belief, he says: "So what? Even if they were true! Silvio should be understood, he was stressed!" The News: Rubygate, here are the papers with the evidences.